The following blog post is by Ed Gastle, product manager, Viavi Solutions. As Viavi Solutions enters into an important industry event for enterprise – BICSI Fall – we have a key product introduction timed for the show. For those not familiar with BICSI (Viavi is very active with the organization to help enable next generation technologies and best practices), it is the worldwide association for cabling design and installation professionals, providing information, education and knowledge assessment for the information and communications technology (ICT) community. Viavi is exhibiting its latest offerings at booth #146. This post is to provide more color around the launch of an exciting new solution – as you’ll see below. We’re excited to see everyone who has registered for Viavi’s launch party, Mandalay Bay, Shark Reef Aquarium — Seascape Ballroom, Monday, September 21st, 7:30 – 9 pm! Now, about the latest innovation. . .
Today’s enterprise and data center networks are being upgraded or purpose built to support the insatiable demand for network capacity. Fiber is being increasingly deployed to support the required data rates. Once deployed, properly testing and certifying the installed fiber infrastructure is the only way to ensure it will support these high-speed applications. However, current fiber testing standards require not just loss and length measurements, they also require the fiber end-faces be inspected in accordance to IEC 61300-3-35. Up until now, there has not been a single tier 1 (loss/length) certification tool that also facilitates end-face inspection and certification in a simple and easy-to-use workflow. Current tools force an inefficient workflow where one tester must be walked back and forth from one end of the link to the other end in order to inspect the fibers. Additionally probe microscopes alone require constant changing of tips to go from inspecting the bulkhead to inspecting the test reference cords. These inefficiencies eat into technician’s valuable time and cost money. The latest in the Viavi SmartClass Fiber addresses these issues directly. 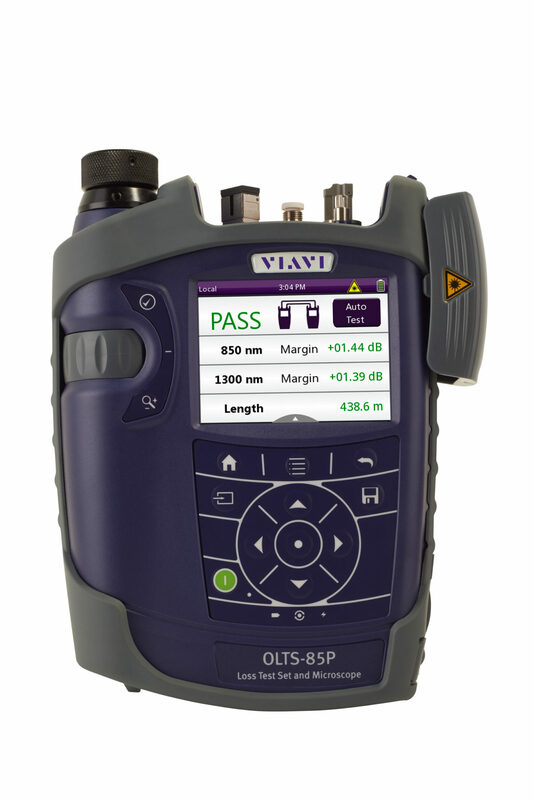 The OLTS-85P combines industry-standard tier 1 fiber certification with the most advanced end-face inspection available. Supporting the P5000i digital inspection probe microscope for bulkhead inspection, having an integrated patch cord microscope for test reference cord inspection, and providing this functionality at both the local and remote ends, the OLTS-85P is the first product to allow installers and technicians to meet the requirements of structured cabling standards without wasting valuable time. With the OLTS-85, Viavi is leveraging its extensive experience with high-speed data-hungry networks and applying it to the enterprise space, where demands are pushing infrastructure into higher performing infrastructure. As we like to say, get the job done right – the first time, and on time. And, get fiber smart with the new OLTS-85P. 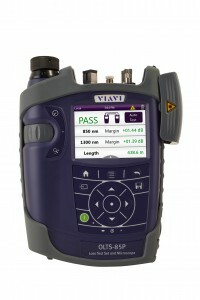 For more information about the new OLTS-85 visit our website. Previous PostMobile’s Future at CTIA 2015 – Viva Viavi!